Although aspirations for an independent Bangladesh have been sprouted throughout hundreds of years in the forms of rebellions by the peasants and downtrodden more visible seeds of Bengali nationalism were sown during the language movement”. 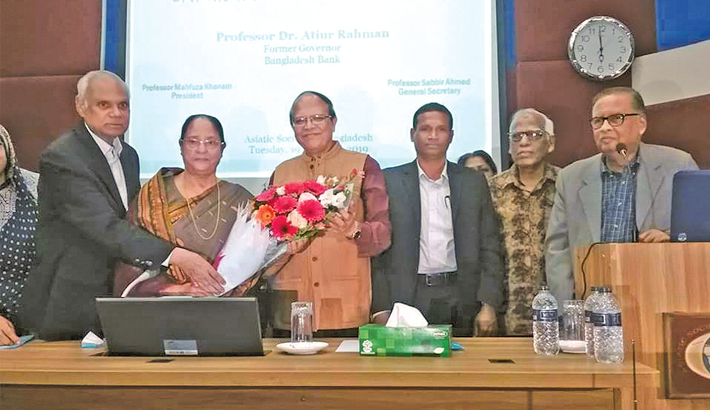 Former Governor of Bangladesh Bank and Chairman of UnnayanShamannay Professor Dr. Atiur Rahman said this while delivering a special lecture on ‘Socio-economic Perspectives of the Language Movement’ at the Asiatic Society of Bangladesh on19 February. President of the Asiatic Society Professor Mahfuza Khanam chaired the event and a number historians, economists, political scientists and other researchers attended. A lively discussion followed the lecture. Professor Rahman further elaborated that the participants of the language movement who were mostly emerging middle class originating mostly from the surplus generated from jute cultivation in Eastern Bengal brought forward the language identity against the religious identity pushed by the mischievous ruling elites of Pakistan. The later used religion as a populist shield to continue their economic and political exploitation of the Bengalis who were majority. The attack on the mother tongue of the Bengalis by Pakistani elites through denial of its legitimate status as a state language put oil in the fire of anguish among the Bengali politicians and the young activists. They got the support of most students and through them the peasants, workers and the emerging middle class. They created a solid base for the language movement which quickly spread into political arena from the earlier cultural domain. In the process the early seeds of Bengali nationalism were sown as the fight for the status of Bangla provided the organised impetus for broader social and political unity in the eastern part of Pakistan. The movement was led by Sheikh Mujibur Rahman with support from the elderly leaders like A.K. FazlulHuq, MoulanaBhashani, Suhrawardy, Ataur Rahman Khan and, of course, his co-leaders from his peers. These younger leaders later led most of the political movements under his leadership culminating into the final movement for an independent state called Bangladesh. They were able to unite all classes under one umbrella for a secular and democratic Bangladesh.The war of liberation which followed these movements was also participated widely by the youths from all the classes including mostly the middle class. And hence this war became a people’s war which was indeed a continuation of all the protests foremancipation of thedowntrodden including the language movement which was the beginning of an end of Pakistan.